Amazon is rolling out a controversial new smart home service that will make sure you never miss a delivery again. Amazon Key is exclusive to Prime members, and allows couriers to unlock your front door to drop off packages if you’re not at home to receive them. The controversial element, of course, is that a delivery person will actually be able to step inside your home while you're not there. The service, which is currently being rolled out in the US, is thought-provoking to say the least. As part of the service Amazon has introduced a new Key In-Home Kit, which it's pitching as one of the most affordable Smart Home security solutions on the market. Costing $249 (about £190, AU$320) the In-Home Kit includes an Amazon Key-compatible smart lock and Amazon Cloud Cam indoor security camera. What's more, there is no subscription fee tied with using the camera or the smart lock – so long as you only need the last 24 hours of footage. If users want to keep any Cloud Cam footage from yesterday or the day before they'll have to sign up for one of these plans below. 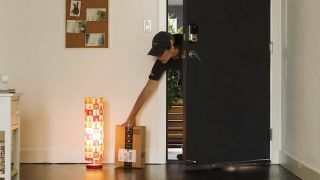 Amazon stresses that these In-Home delivery men are the same professionals who deliver your Amazon packages today. Upon arriving at your door, drivers are required to knock or ring and request to unlock the door before they use their Amazon handheld scanner to get in via Amazon Key. Householders will also be kept fully informed during the whole delivery process. On the morning of the delivery, users will receive a notification with an estimated four-hour delivery window. Before the driver arrives at your door you’ll also receive an 'Arriving Now' notification, with the option of watching your door through the Amazon Cloud Cam. Just in case anything looks suspicious, or users want to deny entry while they’re home, users can 'Block Access' via the Amazon Key App at any time. The other thing users will need to keep in mind is that Amazon Key is not compatible with other home security systems, so they’ll need to disarm their home security alarm on the delivery day. As mentioned, you'll need to be an Amazon Prime member to sign up. The Amazon Key service is currently only available in the US cities listed below or you could check its availability in your area by inputting your zip code at this site. Although, we can see this service eventually coming to all countries in which Amazon operates. Amazon has been on a mission to integrate itself into homes with its Echo-powered smart speakers and screens, and Amazon Key seems like the ultimate way for the brand to become an essential part of your smart home setup.